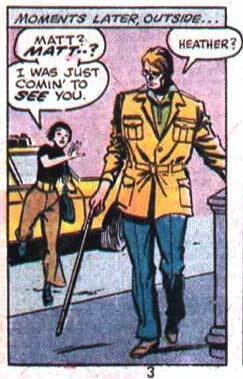 In this early panel from Daredevil #25, by Stan Lee with art by the inimitable Gene Colan, we see an example of the classic Matt Murdock look. A dark suit, usually black, brown or blue, coupled with a tie. It’s a nice, clean conservative look, perfect for a lawyer. Though I have to ask: What the heck is up with that purse? 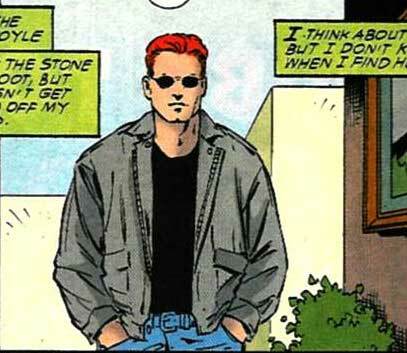 While Matt has kept to this kind of workwear to the present day, it’s interesting that early Daredevil features nearly exclusively images of Matt in either his Daredevil costume or a business suit. 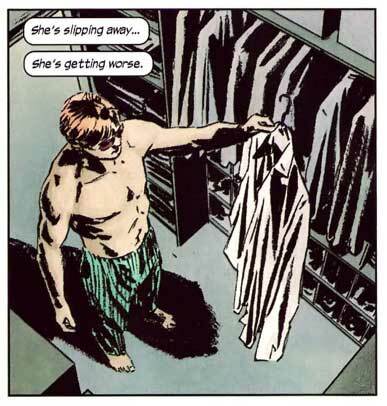 Matt Murdock the civilian who lounges around his apartment in a t-shirt and sweat pants obviously hadn’t been invented yet. 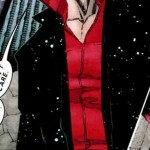 I’ve said before that Mike Murdock is the proof that Matt doesn’t really do colors. This is what happens when he decides to ditch the safe suits and improvise. 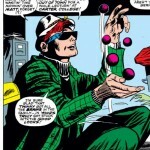 And this outfit, from Daredevil #28, wasn’t even the worst in “Mike” Murdock’s wardrobe. We must wonder where he got this suit to begin with. Maybe a dishonest salesman decided to dump some of the harder to sell suits on the blind customer. Note to Matt: Go with something safer or take your girlfriend with you when you go shopping. Please. This is a travesty. By the 70’s, with more than one hundred issues under his belt, Matt’s wardrobe had diversified quite a bit. There are many items that don’t match the straight one-piece dark suit description. For the most part, he looks pretty darn classy too (as classy as the decade itself allowed). 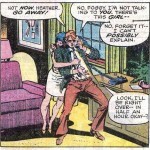 On the left, in a panel from Daredevil #127, by Marv Wolfman with art by Bob Brown and Klaus Janson, we see Matt being more or less attacked by new acquaintance Heather Glenn. I’m not sure I’d match a striped tie with a plaid jacket, but the fit is nice at least. 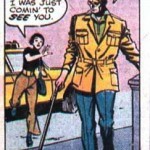 On the right, from the following issue (same creators), Matt is hitting the streets of New York – still with stalker Heather Glenn in tow – in a different kind of outfit. The jacket looks a little big, but I like the fitted pants. 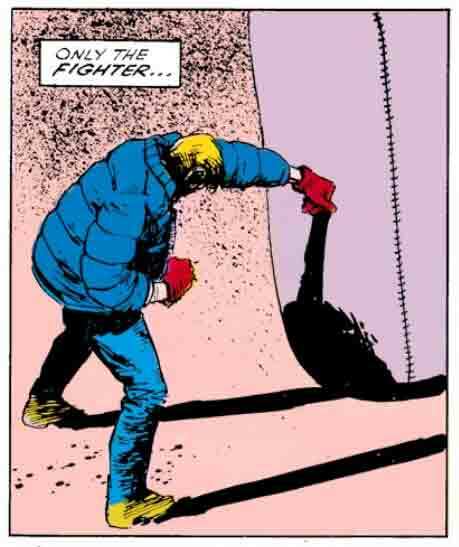 I really like this panel, from Daredevil #185, because it’s such a classic superhero image with the hero revealing the hidden costume underneath his suit. All artwork in this issue is actually courtesy of Klaus Janson, but it’s a good representation of the whole Miller era and echoes his penciling style (which was usually inked by Janson). Lots of blue suits, occasionally ill-fitting, but pretty stylish for the most part. There is definitely a Robert Redford vibe happening here. 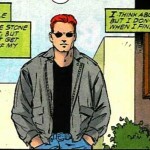 Matt spends quite a bit of time during the classic Born Again storyline walking the streets of New York, out of his mind and stripped of everything he owns. To add to the whole street look, he wears this hideous winter coat. It looks even nicer after the Kingpin nearly drowns Matt although we may have to give it some credit for possibly pulling double duty as life vest. 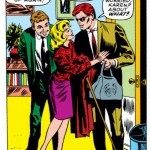 David Mazzucchelli drew an oftentimes stunning Matt Murdock, but this winter coat should be left in the back of the wardrobe where it belongs. 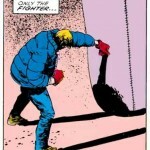 The 90’s may be known for a lot of things, including Daredevil’s switch to the now infamous armored costume. After things got back to semi-normal following Chichester’s time at the helm, Karl Kesel came along and gave the book an unusually carefree vibe. 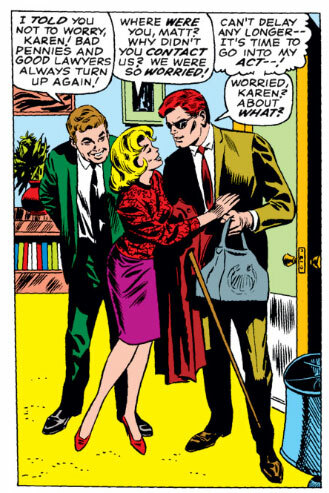 Daredevil suddenly started featuring lots of scenes of Matt and Karen hanging around the house, and we got to see Matt wearing clothes that didn’t scream lawyer. 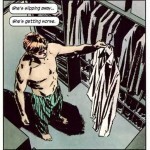 One such example is from Daredevil #351, with art by Cary Nord. 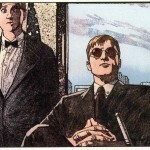 During the Bendis and Maleev run, Matt reached new heights of both style and general attractiveness. Like something from the pages of GQ, Matt really started dressing like a hip New Yorker and even got a goatee to match for a while when he took a break from superheroing. 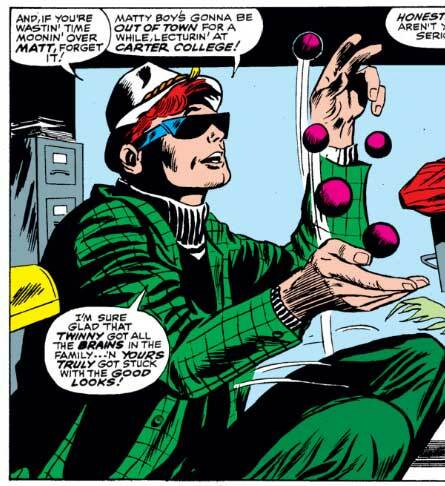 Michael Lark also had the opportunity to try a few different styles, though the orange jump suit was definitely a first for Matt Murdock. After traveling around Europe following his escape from prison, Matt settled back into his normal routine for a while. 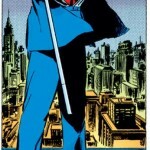 Though maybe things got a little too boring since his wardrobe (shown here in a panel from the Without Fear arc) is obviously filled with many nearly identical business suits. Brown was a common color too, as well as black, bringing us right back to basics. We haven’t seen much of Matt lately as he’s spent most of his time in his Daredevil costume since Diggle took over the book. During the most recent arc, Left Hand Path, we finally got to see him out of costume again, and it was something to behold. Here we see Marco Checchetto try out a new look for Matt and I have to say I like it! 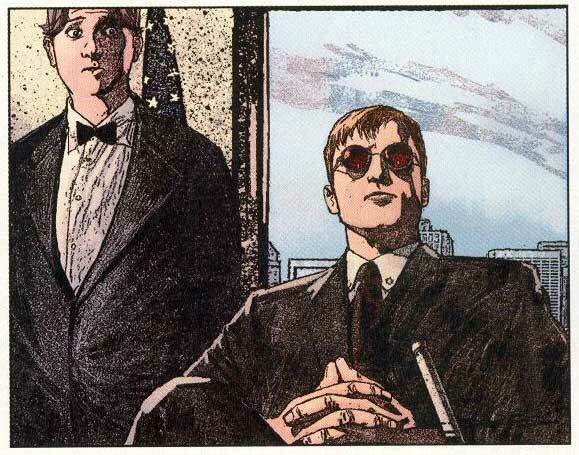 Only the current creative team knows when Matt Murdock will show up in a business suit again, but he usually looks nice when he does. Safari jackets aren’t meant to be form-fitting, so that one from #128 is about right. Always an honor to have you stop by! So, can we expect to see Matt out of costume anytime soon or does he sleep in that thing? Either way, I’m absolutely a fan of the red shirt look. Antony know, as we all do, this is the coolest blog ever. I’m going on e-bay to find a safari jacket right now! Wait, what?! I’m in Berlin for the weekend with limited Internet access, so do tell. Obviously, I hope you’re joking. That’s all I’ve been able to find. Still haven’t found the image they’re talking about. Sounds pretty stupid to me. NOOOOO!!! That blue winter jacket is SWEET! 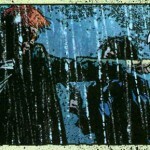 In fact one of my ALL TIME favoirte panels is from that run…with Matt in that jacket!!! I think it looks a little like the 70s and 80s Woolrich early run puffer coats. I LOVE IT! I can see why you might look at it a bit differently. I find it funny, too! GREAT post. KEEP IT UP! Brilliant work! I would also like to she your talk a look on Romitas fashion style. He had a long run and had the opportunities to give it a twist. I have only read the Typhoid Mary story and that is a about 6-8 years. I TOTALLY AGREE, I’m so glad I found this blog. Maleev’s run made Matt very attractive and I felt weird talking about it with non-comic book fans and just generally being attracted to a comic book character but he looked so great.